The best cocktails in Brighton! Join us at the Waterside Bar and enjoy a range of delectable cocktails – made with the freshest ingredients by our expert mixologists. The ideal venue for drinks with friends, an aperitif, or to unwind at the end of the evening. Our featured cocktails are a specially selected mix of old and new, with something for everyone. Also enjoy two-for-one on all cocktails, every day between 4pm and 8pm. 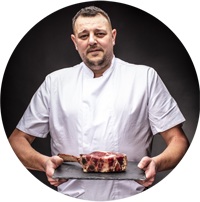 Head Chef Ian Moore, from Brighton, started his cooking career at the age of 16, and has stuck at it ever since. Upon his arrival in the summer of 2018, Ian and team brought a new menu to our casino, using fully fresh local produce.